Hi there! I’m Ian.G and this is my first of hopefully many contributions to Drifted.com. I’ve been in and around the drift scene in the UK since 2004 and its been fascinating to watch the sport grow. With many of the countries race circuits now taking the sport seriously, numerous championships, race car levels of car preparation, seriously talented drivers and teams we can now hold our own at an international level. A lot has changed but the roots of the UK scene are still there…and it will cost you just £10 to experience them. Back in the pioneering times one moment really stays vivid in my mind. That moment was watching Team Blitz’s Nomuken (who was over in the UK shooting a segment for Video OPTION) drifting around Birmingham Wheels to a crowd of maybe 25 people. Back then only a handful of venues would tolerate drifting – but now drivers have much more choice for practice and competition. You can still go and drift a stock car track if you want though, and one of these such places is Buxton Raceway. The Raceway opened in 1974 and is situated in the Derbyshire Peaks near the infamous Cat and Fiddle road. You get snow in the winter and sun in the Summer and a constant ‘light breeze’. Its not Mount Fuji and its stunning raceway – its a stock car track with a continuous steel outer barrier. Just how close you are to touching that barrier is down to you – it does wonders for your car positioning skills though. If you are a seasoned competitor or practice day regular the barrier won’t even bother you as you should be pretty desensitised to proximity – if you are a beginner it can be a little bit daunting. If you do get a bit close its not like tapping a cone – it will leave a graze that’s for sure. Drift One are now offering £10 Sunday drift days typically once a month through the spring and summer months. It costs £10 pounds to get into the venue. 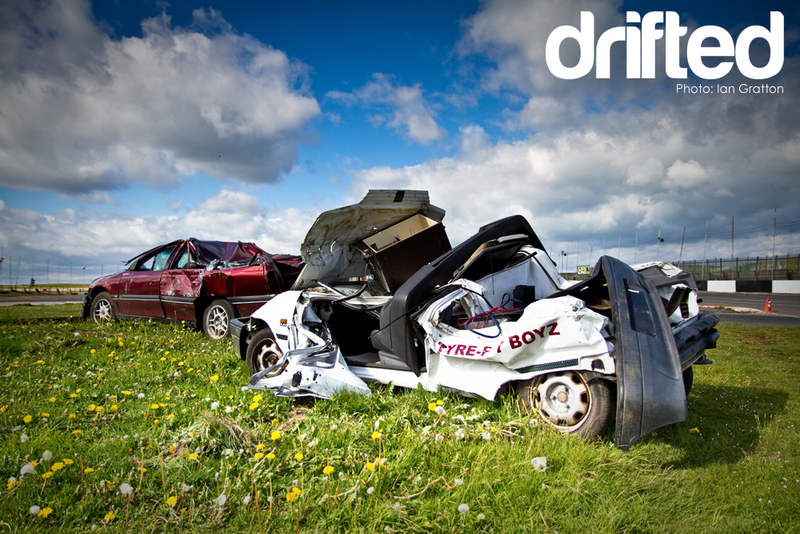 If you want to drift your car it costs you £10. If you want to be a passenger it costs your £10 and that’s it really. Tire changing facilities are on site and its £5 per wheel. Better still there is a while it lasts free supply of part-worn rubber and they will dispose of your old ones too. You can take passenger laps in one of the designated drift taxi’s, and for those drivers interested in a bit of good clean wall rubbing fun, you can compete in the ODC competition for no extra charge. If your car is to competition standard twin drifting is allowed. 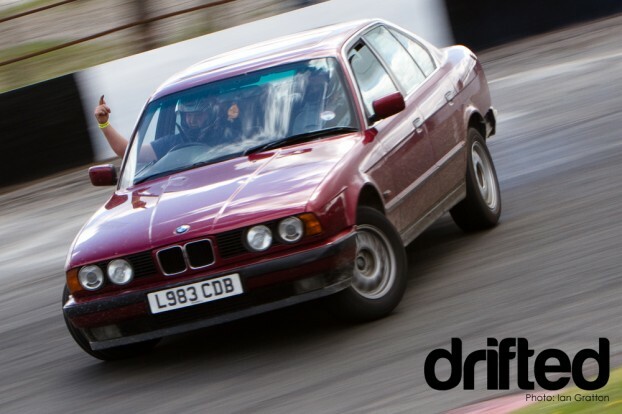 I popped back to the raceway last Sunday to witness yet more wall dodging fun in the ring of steel. Here are a few shots of the locals having lots of fun for practically nothing at all. 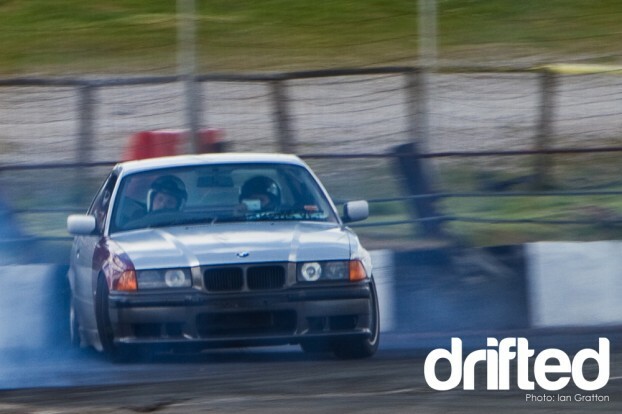 Mike Gaynor kissing the steel in his E36 coupe. Mike is probably best known for his to the floor never-lift attitude and his EDC wildcard entry at Knockhill back in 2008. Mikes throttle return broke mid way through the day but it was promptly fixed by joining together a load of tie wraps from the pedal and the seat belt mount in the b-pillar – pure genius. 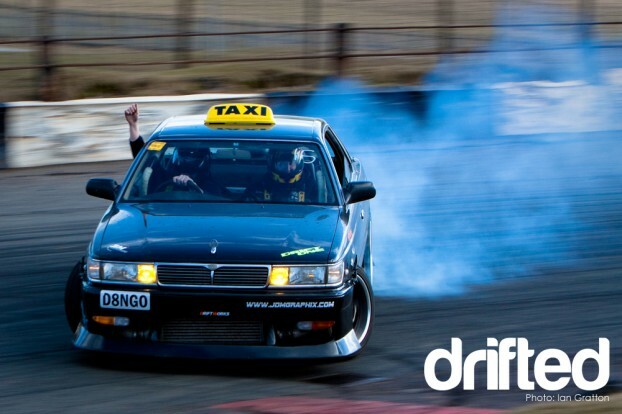 Drift Dango takes a Drift One passenger lap customer out for what is probably their first experience of drifting. The black SR20-powered C33 pictured above is currently out of action whilst it undergoes a RB26 conversion over at Drift Garage. Not wanting to miss out on a cheap day out he was present in this JZ powered Toyota Cresta – quite a rare sight in the UK. Cowpatmatt was a first timer up at Buxton in this little 1.6 Mazda MX5. He seemed immediately at home and not put off by the ring of steel in any way. Linking the corners with nice fast manji moves to get the most out of the little car. 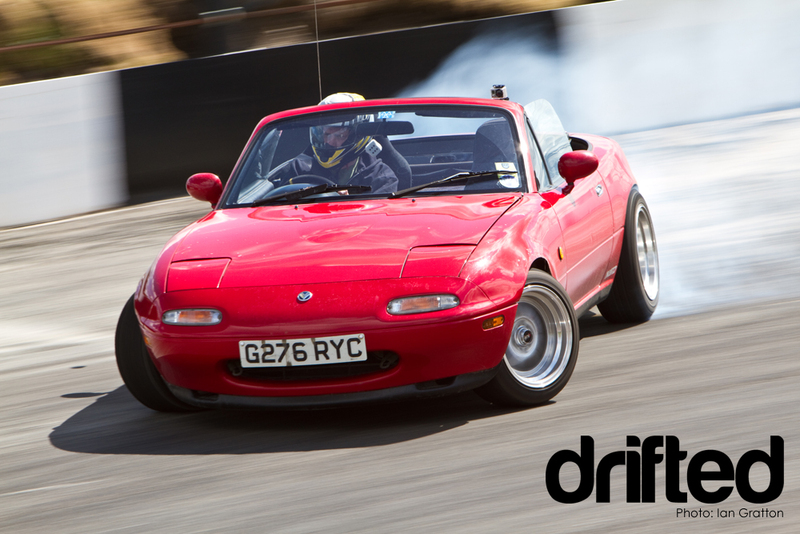 I have a great respect for people who use these little drop tops for drifting – they are a great way to learn weight control as you have to punt them at corners pretty hard to make up for the lack of power on tap. Imagine an AE86 with the roof cut off and you are pretty much there. Unknown local in a BMW E34. This guy was having a ball and once again it just goes to show you don’t need a fully prepped competition car to enjoy the sport. 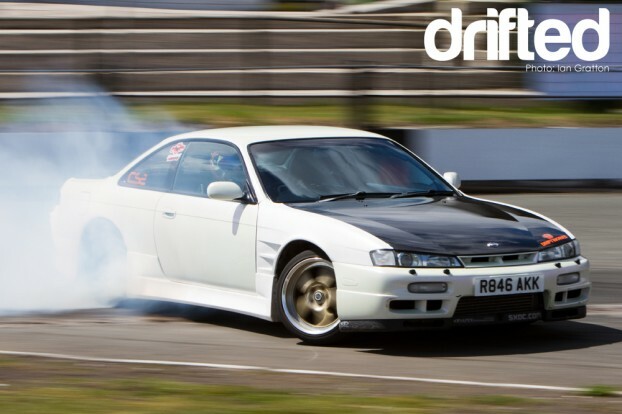 Another unknown in a nicely prepared S14a. I can only apologise for not knowing who you all are. It used to be that everyone pretty much knew everyone who was involved in the sport – its testament to how much more popular the sport has become. 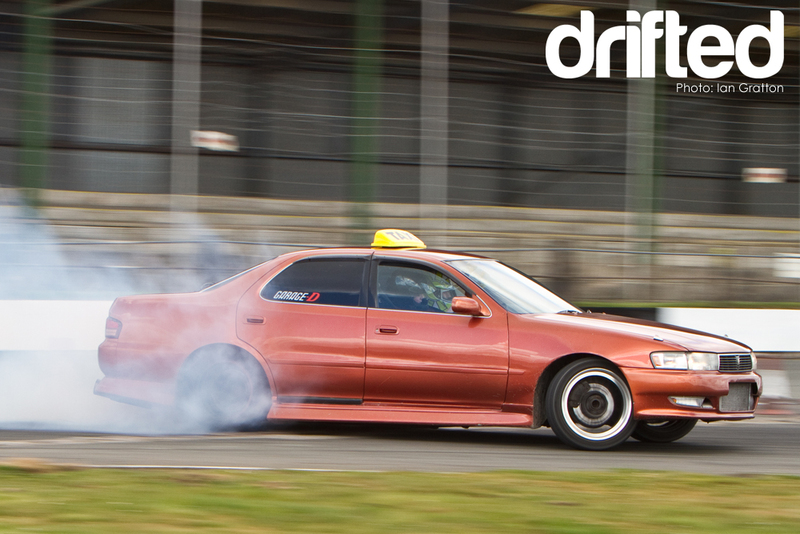 Mitch from Drift Garage was also present at the event in his new SR20DE powered Mazda pickup. 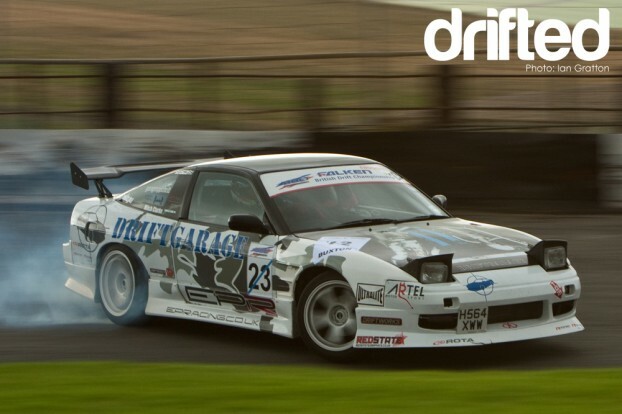 Unfortunately the JZ powered S13 pictured above has moved on and Mitch will be back with another Nissan very soon. You can find more pictures from the day here. The event seemed to go down very well with all the drivers and spectators alike. 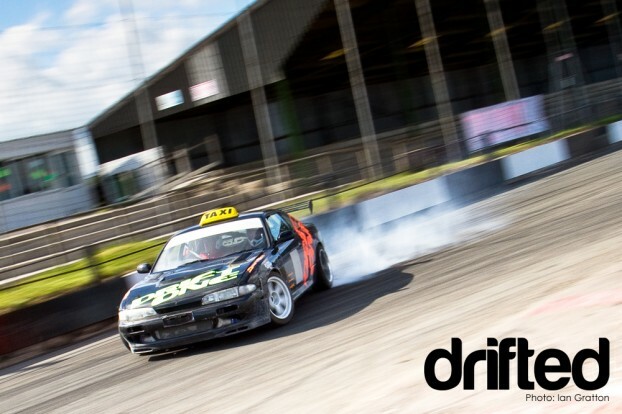 Unfortunately I missed the demo that the Drift One team did at the stock car meeting the following day and the 2000+ crowd were said to really enjoy the show the team put on. It must be quite a slight to see this sort of thing at a venue where when cars enter the arena they usually come out smashed to pieces. Maybe this will inspire some of the stock car and banger racing people to try their hand at drifting ? Only time will tell. So there you go, the roots of British drifting are still firmly planted. Even if you don’t want to risk damaging your pride and joy, maybe it will inspire you and your friends to club together and build something that you wouldn’t mind if it took a bit of a knock. The next £10 event takes place on Sunday July 4th…maybe I’ll see you there ?